Witches' Legacy: Awakening Darkness is rated 4.2 out of 5 by 20. 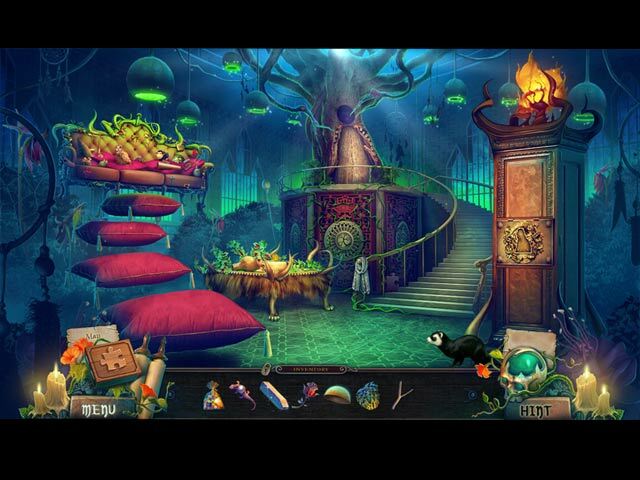 Rated 5 out of 5 by Yurnmesis from Move Forward Entertaining Whimsical-Magical Game! Overall: Beautifully crafted game with whimsical monsters, numerous and attention-grabbing locations with each scene presenting several journeys. Most settings have a HOG and a mini game. The storyline moves forward easily with little backtracking. The graphics are sometimes a little on the bright side, but this is a whimsical and magical story and that corresponds well. Design and crafting are outstanding. The story is predictable but in a way that I found very entertaining and enjoyable. It’s a long game that I will replay. I gave it a five for its creativity and craftsmanship! Graphics: Excellent. Some colors are bright but a good blend. Certainly didn’t distract from the game, since it’s whimsical and magical. Sounds: Good Music: Good with the exception of rather repetitive during games. I turned down music during HOG. Characters: Beautiful, realistic humans. Monsters, some make you laugh, others well your children won’t have nightmares. Hints: Excellent and refresh quickly! Map: Really didn’t need it. The storyline moves forward with minimal backward steps, love that in a game. HOG: Interactive and an excellent mix of games. Great use of HOG for items needed to complete tasks. A few items are too well hidden but overall most items are clearly presented and easy to see. Mini: Excellent from easy to a few complicated ones. Not a mini fan, but I enjoyed trying to solve most of them. Rated 5 out of 5 by dustydog3 from I really enjoyed this game The story was interesting. Loved the music tract, very relaxing. I liked the fact that I didn't have to go back and forth, mindless picking up items and placing them. Good game flow. Got a good laugh out of the dragon hat box. Enjoyed the scenery. If the puzzles were more difficult, would have been a perfect game. I like a little more of a challenge. Lots of fun! Rated 5 out of 5 by boatgirl4347 from OHHH ELE KICKING MYSELF FOR NOT GETTING THE CE!!!!!! NEVER AGAIN!!!! THIS IS A 100 STAR GAME! YOU ARE ALL MAGICIANS! THE STORY THE MUSIC THE VIBRANT COLOR UNEQUALED!!! IM HAVING MORE FUN THAN I HAVE HAD FOR AWHILE THE BEAUTY OF THE OWLS THE CUTE VOICE OF MY BERTHA THE WONDEROUS SPECIAL EFFECTS MAKING TEA FOR TARTA GREAT GREAT HO SCENES!!!!! IM ONLY SAD BECAUSE IM NOT GOING TO PLAY BONUS ERGHHHHHHH I MAY JUST BUY THE CE ON SPECIAL YEAH WHYNOT YEAH!!! Rated 5 out of 5 by denniann2 from meet some new and old "friends" in this game there is a custom level and interactive map. you play as jack who has come home and find that cassandra has aged your mother and taken nikki your sister. you run into morgana from other games and search for you sister and cassandra and the others appear from time to time. you have a ferret friend that is actually a girl under a spell. you have a human friend that is helping you as well. the ferret can go where you can't so she is very helpful. sequel...i feel it is inevitable. the series is well written and seems to be liked by most. Rated 5 out of 5 by spythere from Good Riddance to the Creepy Imp! This was an instant purchase: the first Witches Legacy without the clumsy imp! We have now a ferret which constantly sighs, but else is endearing and skittishly playful. It even knows how to skate on ice - with a snowboard! That ferret is clearly an upgrade. We play as scientist Jack Sanders - which felt a bit odd. Not because I'm a woman, but because I think that a man would be less keen (and maybe less apt) to stroll through a fairy-tale world to tinker with mushrooms, delicate flowers and children's toys. Also, Jack is a bit vain and gazes often into mirrors. But the lucky guy has two capable, female companions: Lynn's daughter Annabel and the bewitched girl Bertha, currently a ferret, help him with the magical bits and parts. I loved how you can click on everything - at least in the first scenes. The little violets wink coquettishly when you do so, strange plants trickle their glassy pollen, lotus flowers croak like frogs. Be sure to tickle the fish in the aquarium BEFORE you put the cage into the water ... and don't forget to try the hellish sweets on the table ;) The whole environment is so highly entertaining, so full of little surprises and lovingly created details: A branch displays all four seasons together, one twig in blossom, one with fruit, one is covered in ice. A little mouse eats Hypericum and falls asleep - but not before having quite adorably yawned. We slip into flowers, walk over clouds, dive into the mind of an old turtle, row in a magically enlarged leaf, encounter animated things and plants from every fairy tale we ever heard, and we discover whole new universes everywhere. Once, we are even downsized to the size of an gnome and find ourself on a breakfast table beside a giant fork. This game is like a goodie bag of pixies' dreams and Alice's wonderland, spiced with all sorts of exotic fruits and crops, thistles, dragon fruits, lychees, physalis, every single one true to detail. I was thrilled to recognize a rare kind of wild onion which I happen to cultivate in my garden. In English it's only listed by its Latin name Allium Cepa var. Proliferum. EleFun has really the knack with plants. WL 7 is also seasoned with humor. I had a good laugh about that lanky, unhelpful watchmaker. Watch him when he smokes the pipe of truth and rolls his eyes ... as if he just had inhaled of those illicit Indian medical herbs, lol. I was less impressed by the three witches. A missed opportunity, imho (think of Macbeth's eerie witches or those hilarious examples from the Disc World novels). Here, they are mostly puppets and silhouettes; however they look like any fashion model, or, in photographs, like actresses from a bad B-movie. They wear identical, black pointed hats of the kind a retired Hogwarts' teacher would wear. Far too young to know anything, they have no personality and go by the names Bella, Hella and Della, *titter* ... those names were the last straw. The responsible devs must have ingested one too many of pipes of truth, whilst they created the three witches :D Challenge is non-existent. Ok., there is a certain challenge in remembering where to fit this key or that puzzle piece, or in finding the last item in a HO without using hints. But generally the puzzles are easy. This does not make the playing uninteresting. You encounter the same old puzzles, yes, but they come in a completely new design, are witty and fun to play again. HOPs are a sheer joy, stunningly beautiful still lifes, and most of them multilayered. That is, you find for instance 8 birds and 8 flowers, before a list opens. Or you insert 4 shapes which open the items list, then 4 compartments unlock with the final item to assemble. Varied in everything, but also theme-related and well integrated into the game flow. And not least supported by gorgeous, mesmerizing music --- which puts a spell on you. Or at least on me; I caught myself at dawdling to find the last items, only to prolong the listening. Forget Cassandra - Alexey Arkhipov is the true wizard in this game. His tunes are pure magic: imaginative, mysterious … and the best remedy against a bad temper. From one track I always get shivers on my eardrums. This composer is not even afraid to play with electronic beats. When did you feel the last time the urge to leap up from your chair and dance to game-music? As you can guess I'm addicted to this sound and own the Collector's Edition. If you want to know what you miss with the SE, check my review of the CE. Not too much, imho, except of course the music download. The main game ends conclusive. Rated 5 out of 5 by sheepqueen from What can I say that hasnt already been said? I LOVE everything about this game. 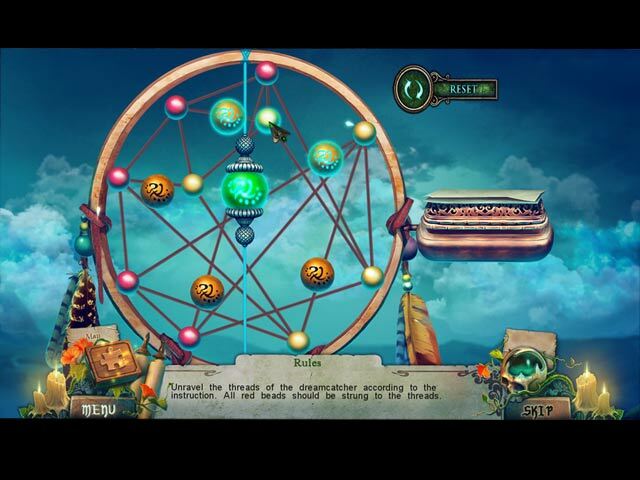 Its fun, has beautiful graphics, great storyline and a nice long game. You cant go wrong with this one. The HOS gives you a choice of doing matching which I really like, Enjoy! 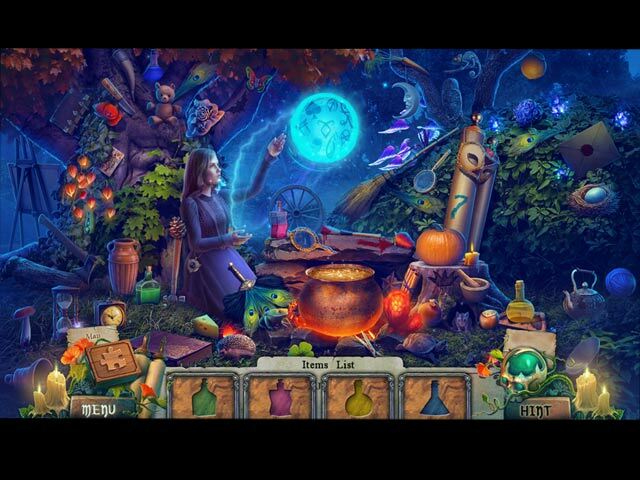 Rated 5 out of 5 by MaryB03 from A Real Sleeper, Very Odd, Very Fun This is not your everyday horror hidden object game. Witches' Legacy reminds me a little of the Drawn series as the art is really beautiful. The lands are amazing. The music is pretty good - I think I'll buy the rest of the series. Rated 5 out of 5 by Tigerfire_62 from Can We Please Have More Like This!! I will take this game play anytime over the same ole boring fantasy crud. With most offered now I cannot wait for them to end.This one is a good one!! Big Fish has talented game developers, they need to start stepping outside their easy comfort zone and create more like this!! Rated 5 out of 5 by kateblue222 from A great game, but which to buy, the CE or the SE? Well, the CE version of this game was so immersive I ran out the demo. So I bought the CE. I do not regret it. But which should you buy now that the SE is also out, if you have bought neither? You are Jack, and you come home to find that your mom and sister are victims of an evil witch who has been trapped for centuries until just before you arrived for dinner. You, of course, must save them. You get a couple of helpers along the way. The background is shown at first by a movie notable for its absence of yak-yak-yak. It's then explained gradually as you play, often through minigames. Much more interesting and fun than a bunch of exposition. The game plays seamlessly with no hesitations, with no extraneous, distracting icons, and with no clumsy actions required. For example, if you are holding an object and you need to zoom in on something to use it, you don’t have to drop the object, then zoom in, then pick the object back out of your inventory, then place it. All those petty annoyances that make you go, "Grr," are absent. Yay! The art is beautifully colored, though dark. The minigames are fun. Sometimes they seem easy, other times tricky. Sometimes they are in more than one stage and you can skip that instead of the whole puzzle, a nice touch. The HOPs are of two types. One type is simple matching to allow you to continue to the next puzzle. The others are full blown HOP scenes with several levels. For example, you find bottles to reveal lists and eventually put an item together. I am not a HOP person, but I know that all the HOP people will love them. The hint and skip are blessedly short, but they are not often needed. I fell in love with the game and had to buy the CE so I could keep playing. But since the CE is now out, you don't have that problem. The extras are ok, but one important one is missing--there is no ability to play minigames and HOPs over--a downgrade for me. But all the other features are there, including: -bonus chapter, -a puzzle that you find pieces for during the game, -morphing objects, -the usual music and art. So, if you really like the game and want to continue with the bonus chapter, or if you like the other special features, buy the CE. But at least buy the SE because you will have fun.